Parents and leaders from across sectors believe in the power of sport to build healthy children and communities. They're concerned about rising participation fees, high attrition and low physical activity rates, injury risks, and a shift away from unstructured play. They also recognize that no one group alone can address these trends. Project Play connects the silos and drives progress. Launched in 2013 by the Aspen Institute Sports & Society Program, the initiative develops, applies and shares knowledge that helps build healthy communities through sports. We produce reports that take measure of the state of play at the national, regional and city levels, with exclusive data and insights. We create frameworks and tools that stakeholders can use to grow access to quality sport. Then each fall, we pump new ideas into the bloodstream and push the movement forward at the Project Play Summit, the nation's premier annual gathering of leaders at the intersection of youth, sport and health. We also mobilize leaders at the community level. In Baltimore, Harlem, Southeast Michigan and Western New York, we use Collective Impact methodology to create shared agendas and develop mutually reinforcing actions. We help foundations shape grant-making criteria, and connect local groups with national organizations that can lead to new investment or innovative partnerships. Most of our work to date has been focused on the base of our sport system, given the myriad benefits that flow to physically active children. In 2015, Project Play released a report that amounts to the first national framework on how to provide all children 12-and-under access to quality, affordable sport activity. 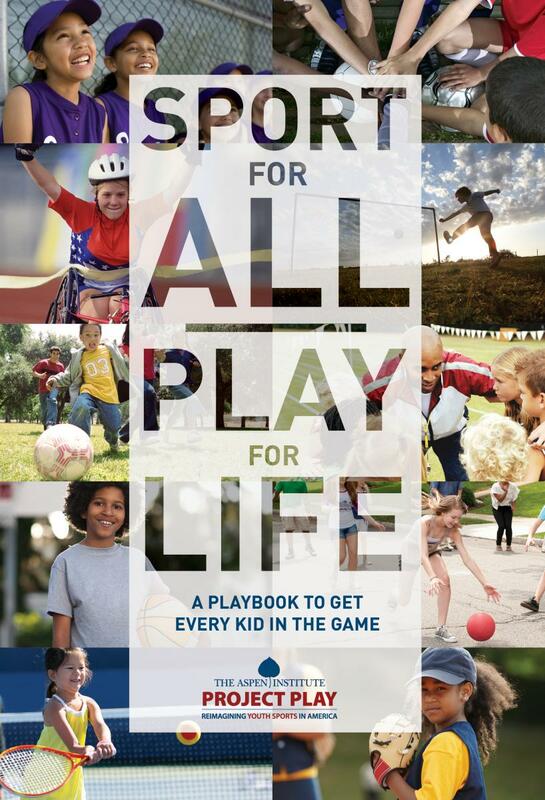 A unifying document aggregating the most promising opportunities to emerge from two years of roundtables with 250+ experts, Sport for All, Play for Life: A Playbook to Get Every Kid in the Game offers a model based on the values of health and inclusion, with eight strategies for the eight sectors that touch the lives of children. The playbook quickly became one of the most-read reports in the history of the Aspen Institute. In his keynote at the 2015 Project Play Summit, then-Surgeon General Vivek Murthy said, “You have built a very powerful roadmap“ for innovation and cross-sector collaboration, and encouraged groups to develop actions inspired by the report's concept of what good looks like in youth sports. That, indeed, is what has happened. 100+ organizations have used our work to shape their youth strategies or introduce symbiotic programs. Among them: professional leagues, media companies, national sport governing bodies, the YMCA of USA, parks and recreation departments, community sport providers, and the President's Council on Fitness, Sports & Nutrition. At the 2018 Project Play Summit, 20 organizations were recognized as formal Project Play Champions for making new, specific, meaningful commitments to action. The U.S. Olympic Committee has advanced efforts to implement the American Development Model, a framework supported by Project Play to anchor our sport system in the principles of developmentally appropriate play. The first recommendations for the sport sector were created for the National Physical Activity Plan, inspired in part by Project Play. The Aspen Institute Sports & Society Program helped craft the recommendations in 2016 as members of the advisory group. 40+ influential sport bodies endorsed multisport play in response to the trend toward early sport specialization. NCAA leaders wrote a column for the Aspen Institute encouraging multisport play and calling on college sport leaders to reexamine early recruitment rules. Citing our work, major news media outlets have helped create a national conversation about access to and the challenges of youth sports. Among them: Time, NPR, The Washington Post, ESPN, SportsBusiness Journal, The Atlantic, and BBC. Read the coverage here. The concept of "physical literacy" has been defined and elevated across sectors. With the support of the Robert Wood Johnson Foundation and the guidance of a working group of experts from education, academia and sport, the Aspen Institute produced the report Physical Literacy in the United States: A Model, Strategic Plan, and Call to Action. Community and regional foundations such as the Ralph C. Wilson, Jr. Foundation have entered the space, dedicating more than $25 million in grants to youth sports and shaping grant criteria to align with Project Play's eight strategies. Separately, another $200 million was committed to building greenways with bike paths and recreational infrastructure in Detroit, Michigan, and Buffalo, N.Y. Deep, original knowledge on how well youth are being served through sports has been developed at a geographic and population level in cities, counties and regions. Starting in Baltimore and continuing in Harlem, Southeast Michigan, Western New York, the Greater Rochester area, and Mobile County, Ala., local State of Play reports have been produced, providing foundations, sport leaders and other stakeholders with an essential tool in filling gaps. In 2019, Seattle/King County, Wash. and the state of Hawai’i will be landscaped by Aspen in partnership with the University of Washington and Liliʻuokalani Trust, respectively. Collective progress has been made in reducing the percentage of youth who have no exposure to sport activity. In 2014, 19.5 percent of youth ages 6 to 12 did not play a sport in any form even one day during the year, according to the Sports & Fitness Industry Association, which conducts an annual household survey of sport participation and physical activity patterns. The latest data, from 2016, showed that figure had fallen to 17.9 percent. To further grow access to sport and improve key metrics as captured by SFIA, major industry groups and nonprofits in 2017 came together for the first time to pursue shared goals. In 2018, Project Play 2020 members created a free coaching course, How to Coach Kids, with a website that includes links to sport-specific resources. Other members collaborated to create the Healthy Sport Index, which assesses the health impacts of playing the most popular sports and can be used by parents and kids to inform the decisions they make about sport choices. In 2019, the Teamwork Toolkit, a DIY resource to mobilize leaders at the local level, will be introduced. Parent Checklists have been created to empower caregivers to get and keep kids active through sports. The three, 10-question checklists are tailored to the age and engagement level of the child, and include companion video and links to resources. Additional resources designed to help parents will come online in 2019. A tool has been created to measure progress on annual basis, the national State of Play report, which offers the latest participation data, as well as exclusive insights and crowd-sourced grades on how well stakeholders are serving children and communities through sports. The Project Play Summit has grown from one day to two. In 2017, a workshop day was added, with content designed to help local leaders create shared agendas and mobilize stakeholders where they live. The summit sells out each year, and #ProjectPlay annually trends nationally on Twitter during the event. Past speakers have included Major League Baseball Commissioner Rob Manfred, Olympian Allyson Felix, Kobe Bryant, Jackie Joyner-Kersee, skateboarding pioneer Tony Hawk, and Michelle Obama. Now, other countries have begun using the Project Play framework to reimagine their sport delivery systems for youth. In 2017, the Aspen Institute in Romania announced a partnership with Romania's Olympic committee to develop a plan. In 2018, the Aspen Institute in Mexico launched a similar nationwide project and an academic journal in Japan published an analysis of Project Play’s work. In sum, Project Play has become the engine to reimagine community sports – in their best form. An initiative of the Aspen Institute Sports & Society Program, Project Play develops, applies and shares knowledge that helps stakeholders build healthy communities through sports. The mission of the Aspen Institute Sports & Society Program is to convene leaders, facilitate dialogue, and inspire solutions that help sports serve the public interest. The program provides a venue for thought leadership where knowledge can be deepened and breakthrough strategies explored on a range of issues. More: sportsandsociety.org.